Yosemite is full of hiking trails, many of them suitable only for the ultra-fit hiker with lots of stamina and determination, but don't let that intimidate you. There are some nice, short hikes in Yosemite Valley that almost anyone can manage. These are the most popular places for easy hiking in Yosemite Valley. See where they start on this Yosemite Valley map. Some of the hikes below mention stops which are on the Yosemite Valley Shuttle System. Mirror Lake is a shallow, seasonal pool that fills with water in the spring and early summer. The rest of the year, it can be completely dry, but anytime it's a favorite place to hike to, especially for families and it gets you close to the base of Half Dome. The surroundings are spectacular: huge rocks, lovely meadows, and excellent views of Half Dome. In fact, this is about as close as you can get to the base of Half Dome and when the lake is full and clear, it reflects beautifully on the surface, and you'll have no trouble figuring out how it got the name "mirror." You can extend your hike on a 4-mile (6.4 km) loop trail around the lake, which re-opened in late 2012 after being closed for several years after a rockslide. The loop trail branches off to the right shortly after you start your hike. The trail is paved most of the way, but it can be snowy or icy in winter. This trail is also used for horseback riding, and hikers sometimes report that much if it smells like horse droppings. If you walk to the trailhead from Yosemite Village instead of taking the shuttle bus, it adds 1.5 miles (2.4 km) each way. Leashed pets are allowed on the paved trail only, and the trail is also wheelchair accessible. The short hike to Bridalveil Fall is one of Yosemite Valley's easiest - and most scenic. It's most spectacular in spring and early summer, when the falls are at their peak flow and in the afternoon, you might see rainbows in the spray. Bridalveil Fall is named for the mist that wafts off it when the wind blows, giving it the appearance of a wedding veil. During especially wet years in the spring, that mist may make you wish you had an umbrella - or a raincoat to keep you dry in the spray, which can also make the trail a little slippery. The fall flows all year long, but at a lower rate. The walk is easy, but the trail can get icy in winter. You can hike to Bridalveil Fall from two trailheads. The shorter trail starts from the Bridalveil Fall parking area off US Hwy 41. If that's full, you can park along Southside Drive, where you can also get a view of El Capitan and take a slightly longer trail that crosses Bridalveil Creek. The trail from the Hwy 41 parking area is paved. From Southside Drive, the path is wide and easy to walk. From either starting point, you'll end up at a viewing platform at the base the waterfall. Leashed pets are allowed on the paved trail. Yosemite Falls take a couple of breaks on its way down the granite walls of Yosemite Valley, breaking it into sections. The most scenic easy hike in the Yosemite Valley starts with a spectacular view of it and ends at the base of the lower section of the falls. The two paved paths both lead to the viewing bridge, creating a loop trail. Views are better on the west half of the loop, and the middle section is through the woods. It's a busy trail where you'll encounter a lot of other hikers. Yosemite Falls reaches its maximum flow in the spring and continues into the early summer. It's dramatic then, but you may get wet from all the mist. In dry years, the flow may almost stop from late July or August through October, reducing the falls to a trickle. In the winter, the trail can get icy, and in the morning when temperatures drop below freezing, the upper section of the falls can freeze solid. When the temperatures drop suddenly, the waterfalls' mist turns into a slushy flow called frazil ice. If you park at Yosemite Village and walk to the falls instead of starting from the parking area, it will add about 1 mile (1.6 km) round trip. If the parking area along Northside Drive is full, try the lot at Yosemite Lodge. The eastern half of the loop is wheelchair accessible. Leashed pets are allowed on the paved trail. The Vernal Falls Footbridge hike is the most difficult of these easy hikes, steep enough that you may work up a sweat. It follows the longer Mist Trail to a bridge across the Merced River with a view of Vernal Fall. It's a good way to get a little sample of the longer, more strenuous hike that continues all the way to Half Dome. In spring, it's easy to figure out where the Mist Trail got its name, as the fast-flowing waterfalls kick up a spray. That can make the rocks slippery, and the water flows fast during spring runoff, making it a dangerous spot to go off the trail. Don't be misled by older photos of the view from the Vernal Fall footbridge. Growing trees have intruded into the scene, but if you go just a few hundred meters up the trail past the bridge, you'll get a clearer view. This flat hike has a high scenery factor, going right through the middle of Yosemite Valley and giving you plenty of time to gawk around without worrying about traffic. It's also one of the easiest hikes in Yosemite Valley. 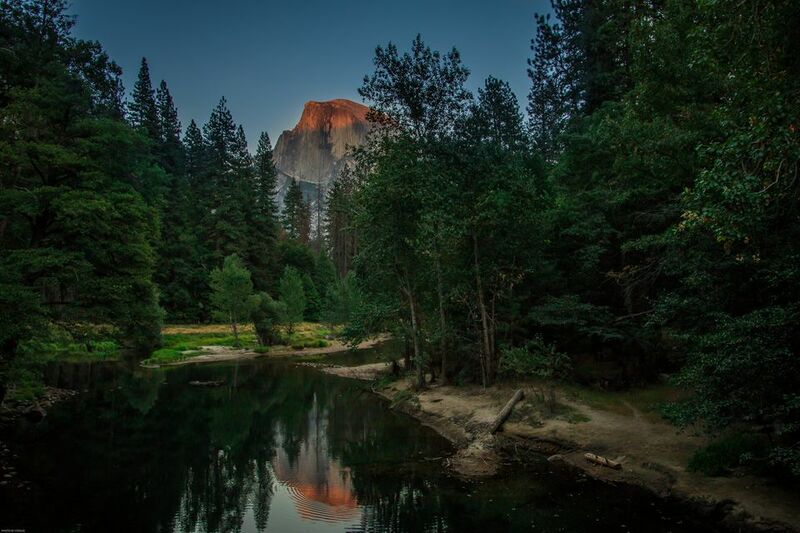 Even though a lot of people take it, it seldom feels crowded, and you'll be so absorbed in the scenery that you won't even notice when the road is nearby, especially when you're gawking at Yosemite Falls, Half Dome, Glacier Point, and Royal Arches. The meadows are most scenic in spring and early summer when the grass is green, wildflowers are blooming, and the waterfalls are at maximum flow, roughly from late April to mid-June. The path can be a little snowy or icy in winter. Take insect repellent in the spring to keep the mosquitos away, and watch out for speeding bicyclists. You can start this loop trail from anywhere along its length. Good places to start are off Southside Drive near the Swinging Bridge, the Yosemite Falls trailhead, or the Yosemite Lodge. The trail is wheelchair accessible and leashed pets are allowed. If you want to know more about hiking at Yosemite, you can find it at the ​Yosemite National Park website.